To me eggs are a perfect food. They can make a meal or a snack; you can style them up or down; breakfast, lunch or dinner: eggs will work. 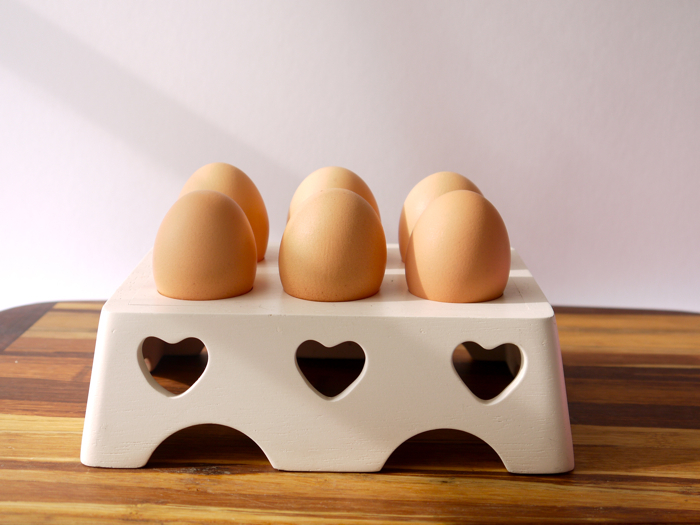 Eggs are one of the core staple ingredients I always buy, if I have eggs in the house then I won't go hungry. I never really liked chocolate eggs, there was never that much chocolate and it tended to be the second rate stuff that went into it. I'd much rather have a full bar or really good chocolate, for the price of a mid end chocolate egg I can get a much higher end bar of chocolate than I'd normally buy. Regular eggs though rarely disappoint, they're such a humble ingredient that nobody ever raises their expectations beyond what eggs can deliver. 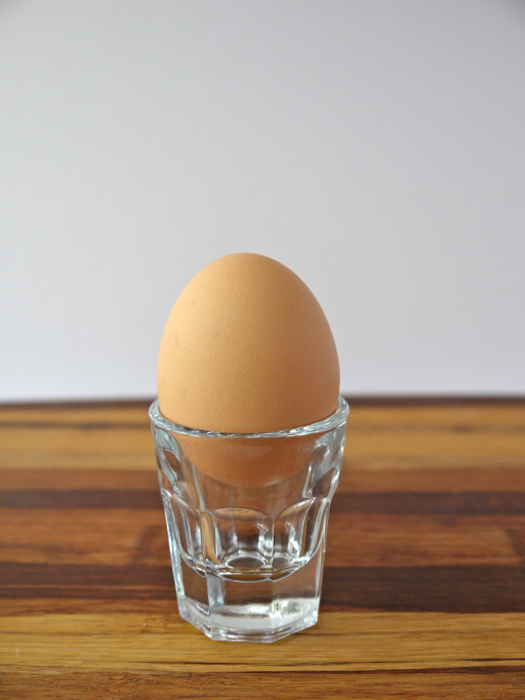 Pro tip for those of you with small kitchens, make sure everything you own can serve a double purpose, shot glasses make perfect egg cups. My favourite eggs are scrambled. It's so easy to adapt the recipe and means you can eat them every day and they'll always be different. To start, eggs: three per person. Adjust for personal preference and hunger levels. 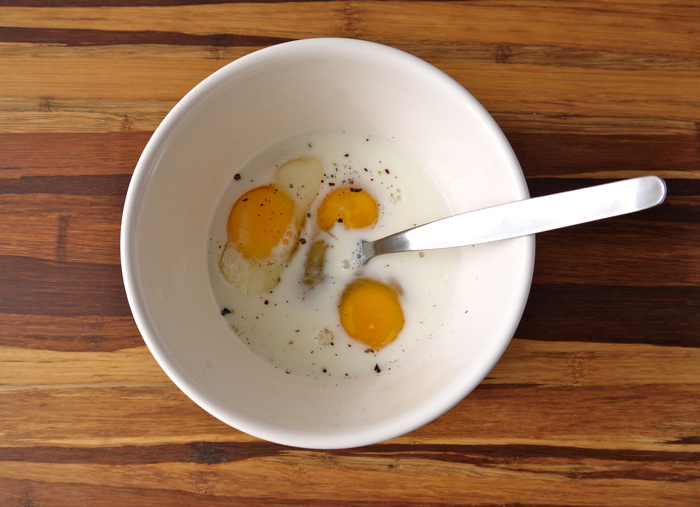 Add a splash of milk, the milk helps make the eggs lighter and fluffier, a pinch of salt and a crack of black pepper. Other fun ingredients at this stage can be chili flakes, chives, cheese or whatever you happen to have lying around in the kitchen. Avoid Nutella. Use a fork to mix them all up together, try and get it looking frothy as all that air will help keep your eggs fluffy. You can also use a whisk to do this, but since I'm the kind of person who uses shot glasses for egg cups what makes you think I own a whisk? The key to good eggs is heat. When you cook them keep the heat as low as you can, this will take time but it's worth it to avoid rubbery eggs. My cousin likes to cook his scrambled eggs in a glass bowl above a saucepan of water on a very low simmer but that takes about an hour and the egg result is still only scrambled eggs. However, if you have an important deadline coming up and need to do some serious procrastination then try it. I just use an unholy amount of butter, melted until it froths, and keep moving your eggs while your bread toasts. Don't try and cook the eggs until they look cooked, this will cause them to be over cooked. 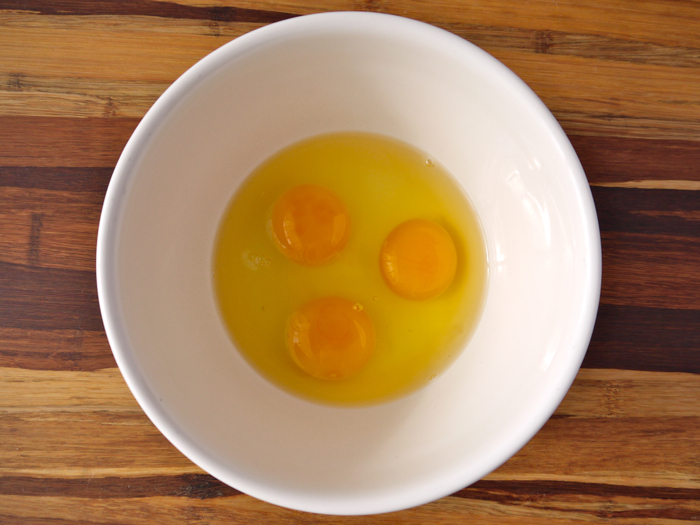 Eggs carry on cooking in their own heat, so cook them until they're nearly cooked but still quite runny. For my eggs today I stirred in some scraps of smoked salmon, most supermarkets sell packs of trimmings for about £1 and they are perfect to add a little bite of luxury for a very low cost. 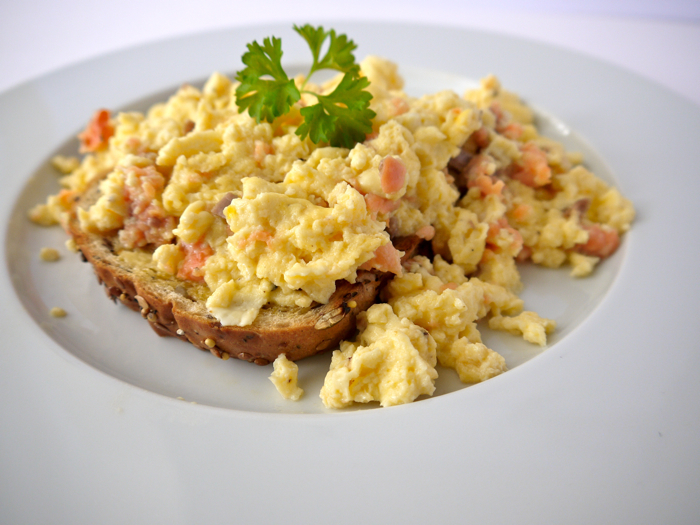 Pour the eggs on top of your bread and enjoy.